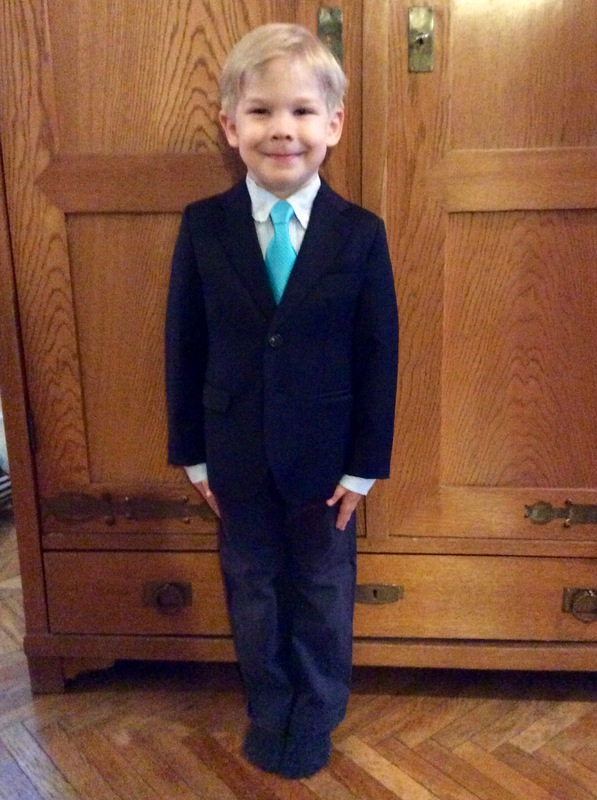 Yesterday we celebrated my older son Paul’s First Communion together with his class in the Canisiuskirche in Vienna. The weather was not what we’d hoped for, but other that that it was a really beautiful day. The kids were lovely and extremely well-behaved. It was well organized, and Pauli did the reading (not actually reading it, since the kids had to learn all the texts by heart) very professionally. We were so proud! I was kitted out with a mega-pack of tissues and that was a wise precaution. Watching my baby up there was an emotional experience. Today I only have a few (bad) iPhone pics to share with you, as photography in the church was not permitted, we will get the official photo CD soon though and I want to show you a few more images then, if you’d like to see. After church we had a lovely meal with family and friends. My heart is full today and I’m grateful for my life. I wish you all many such days. 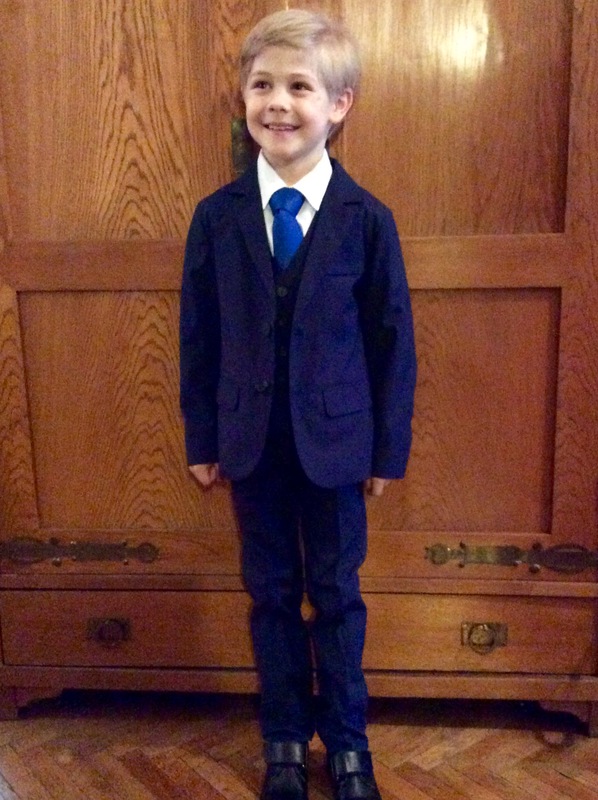 This entry was posted in Ramblings and tagged Children, Family, First Communion, Kids. Bookmark the permalink. I’m really happy that you and your family had such a great day. Pauli looks wonderful and so chic!! In fact, both boys look just great. They look a lot like you, don’t they. In these pics Pauli looks the paragon of a big brother. Just lovely. Thank you, Marjo. 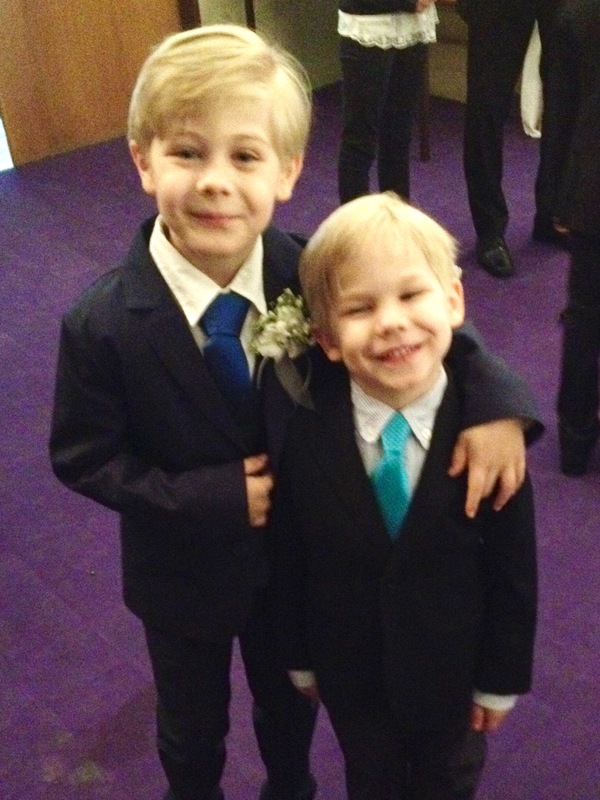 The boys were so happy being all dressed up and the ceremony was truly beautiful. Adorable! Pauli looks like both of you in a 50/50 ratio, I’d say. So grown up. In fact they are both growing up really fast compared to my memory of them. What a proud mother you must be. 🙂 Quite understand the tissue requirement! Just fabulous. Well done to Pauli for remembering his lines (though we know he’s good at that after his poem triumph!). Love the way Niki is standing as straight as a soldier. I’m so happy the day went so well. One to treasure. Thanks for your kind words, T, the boys are thrilled. Thank you! Have a lovely weekend too! Wow, they are growing up fast. He looks like a little man now. Congratulations and I’m happy to hear the day went well. They are growing up so fast indeed. Congratulations dear Birgit, and thanks for sharing the sweet pictures. I’m happy that you had such a lovely day. Thanks for sharing this momentous occasion. 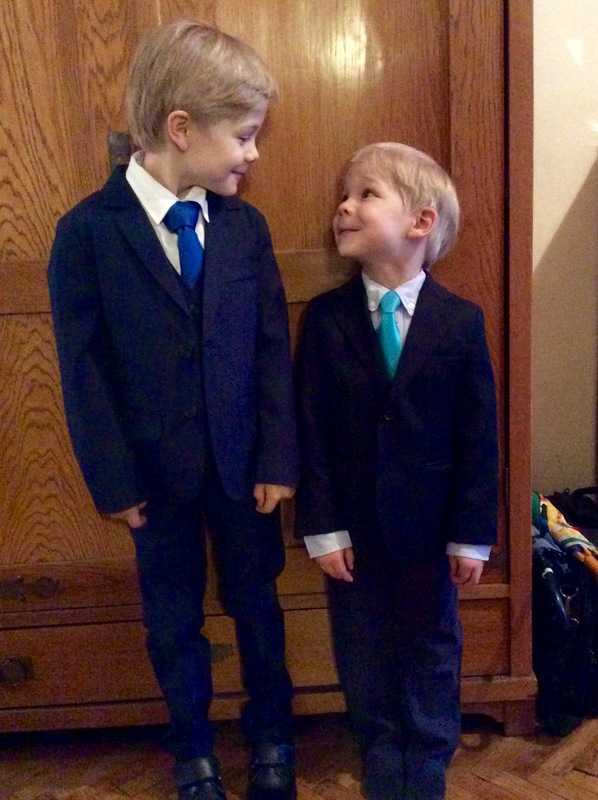 Your boys look so grown up! And ues please on the “official” photos. Thanks for reading! I will post a few official photos once I get them. Pauli looks so much like you, Birgit, and Niki with his impish grin reminds me of Dr O. They are both adorable, impeccably groomed, and give you ever reason to feel proud and blessed. Congratulations on the occasion and thank you for sharing it with us! Lovely. Beautiful for you and your husband and they look like charmers. It looks like it is an event done earlier than here, usually it is second grade in America, about 8 years old. Your son isn’t that old is he? WOW!! You have two fabulous kids Birgit. Congratulations. They both seem to have inherited Michael’s cheeky demeanour, very cool..
What handsome young men! Best wishes to you and your lovely family. What handsome boys! And what a memorable day for all of you. It’s obvious how proud you are of them and rightly so. Thanks for sharing a peek inside your special day with us. I’m guilty of pride, yes. 😦 But I wanted to share my happiness. Oh my. They look so gentlemanly and happy! And the matching smiles are the best. Thank you for sharing pictures from your family’s memorable event! Thank you, Nemo. It was a good day indeed. Thanks so much, Nana! I hope you had a wonderful Sunday too! Such lovely photos of your two gorgeous boys. I love their cute smiles! It’s OK if they let off a little ‘steam’ when they get back home – after being on their best for a long time in Church, no doubt. Congratulations and thanks for sharing your lovely day with us Birgit. Thankmyou, Annette, so kind of you! Just got around to catching up blog reading. Thank you for sharing these beautiful photos. 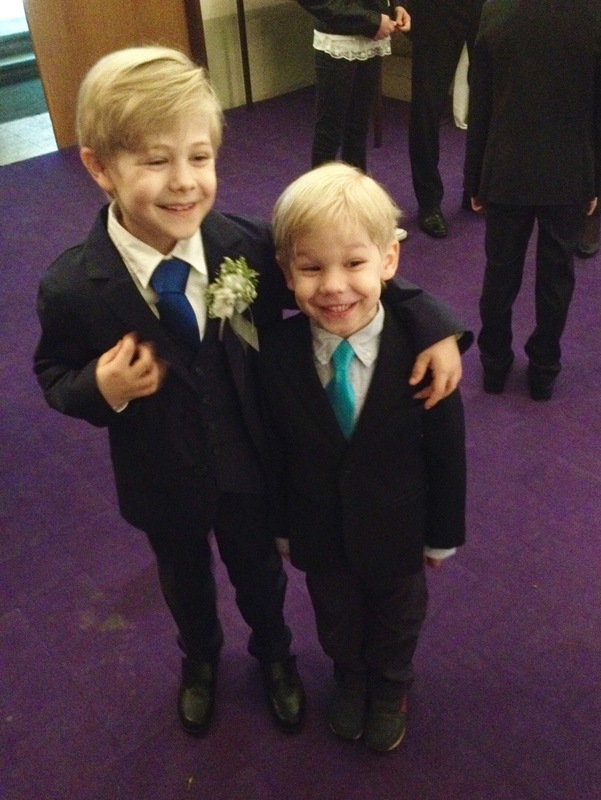 Your boys are so handsome and growing up fast! I’m so happy you had this wonderful day with your family! Cherish these moments, before you know it they will be graduating from university!